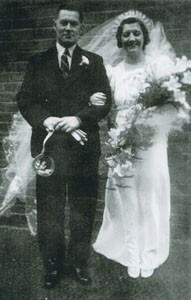 Photograph of Mr. Brown and Miss Taylor after their wedding. Mr. Brown is standing on the left and Miss Taylor has her arm linked through his. Miss Taylor’s veil is being blown behind Mr. Brown. Mr. Brown is carrying a lucky horseshoe.